Some of the concrete beams and slab that had collapsed at the building site at Periyamulla. 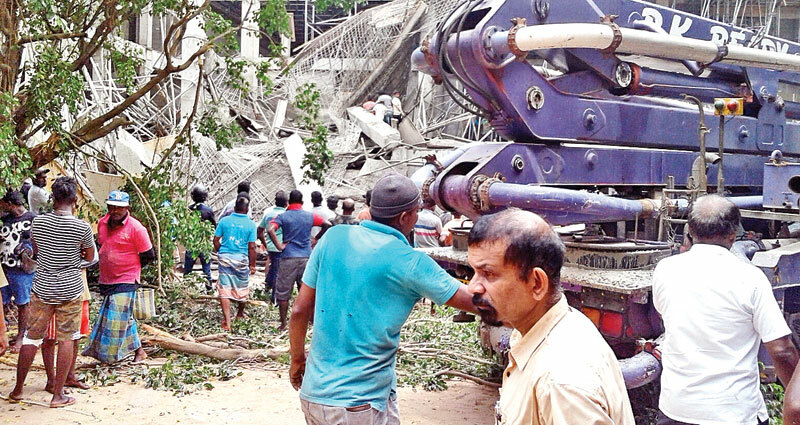 Four people were seriously injured after a three storey building under construction collapsed in Periyamulla, Negombo yesterday. The four injured construction workers who were buried beneath the rubble were rescued by the Police and rushed to the Negombo hospital. Three of the injured workers were in a critical condition, according to hospital sources. At the time of the incident seven construction workers had been working at the site. Three of them had escaped unhurt. According to the Police, several concrete beams and a slab had collapsed bringing down at least half of the building which was under construction. The four injured workers had been working in the upper floor. The building was to be used for a hotel and a shopping centre. The Police have launched an investigation.